How in the world did we get to Monday already? The weekend seemed to just fly by, as they usually do these days. They’re always jam-packed, from wedding planning to wedding-related celebrations, to the simple day-to-day tasks, to somehow managing to find time to work on this blog. The weekends of “lazy Saturday mornings” and Sundays lounging at the beach are quickly fading from memory. It’s incredibly busy times like these, when I feel I barely have a moment to catch a breath, that I realize why I am such a proponent of balanced living. I find myself easily overwhelmed if my “To-Do” list contains more items than hours in the day, and I realize that my equilibrium is slightly out of whack at best. But as we know, times like these come and go and I know I will eventually find that balance once again. Until then, we have doughnuts. And not just any doughnuts. These doughnuts are filled with belly- (and heart-) warming vanilla and ginger and topped off with a tangy, sweet pomegranate glaze. They’re baked, so we don’t have to feel so bad about turning to them in these times of need. They’re going to get us through the craziness, hence why they’re also the perfect recipe for me to share with you on this here start to a long work week. 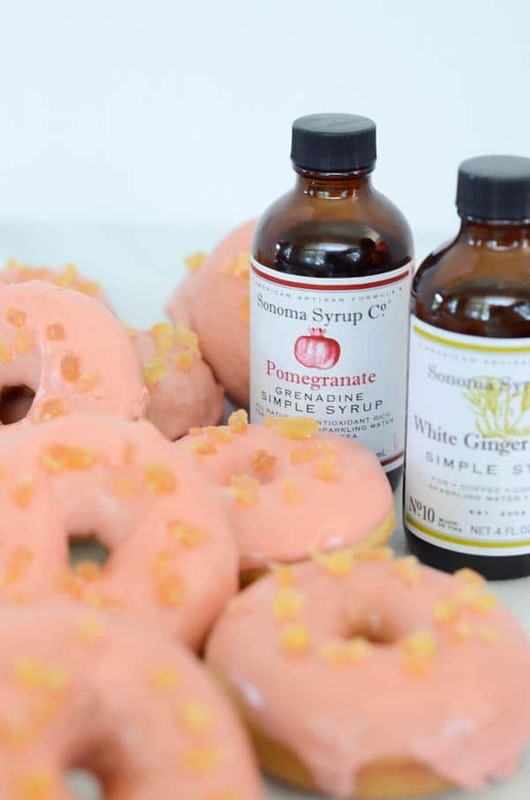 But before I get into the details of these Vanilla-Ginger Doughnuts with Pomegranate Glaze, I MUST tell you a little bit about the amazing company that is Sonoma Syrup Co. Founded in 2002, Sonoma Syrup Co. takes pride in bringing fresh, regional flavors and “terroir” into all of their products. Here’s what absolutely sold me on this brand: They believe that healthy food/beverages and great flavor can live in synchronicity. They realize that sugar is a small indulgence, so they take pride in only using pure cane sugar and fruits and botanicals farmed organically. If you’ve been reading this blog for any long-ish period of time, you know that I believe in a balanced lifestyle filled with only the highest quality indulgences. So, basically, Sonoma Syrup Co. is my spirit animal. 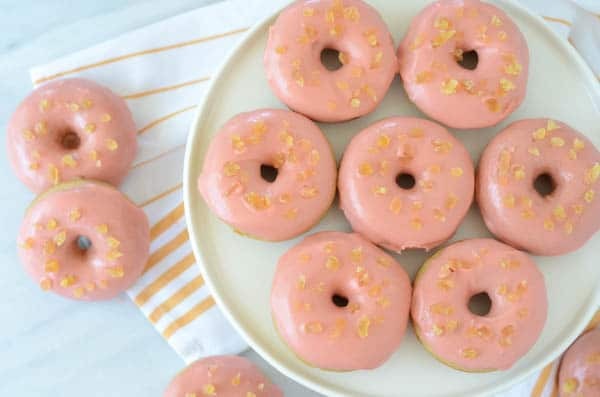 Now that you know why I am such a fan of their products, let’s get to the deliciousness that is these Vanilla-Ginger Doughnuts with Pomegranate Glaze. We start with a classic cake doughnut batter, mixing both flour AND cake flour (yes, it’s important to use the two different kinds) together with our Sonoma Syrup Co. White Ginger Infused Simple Syrup and a little touch of ground ginger to really make the flavor shine through. Of course we also add in the other basic baked good ingredients, but I won’t bore you with those. For the glaze, we make a classic powdered sugar glaze, but add in Sonoma Syrup Co.’s Pomegranate Grenadine Simple Syrup and some fresh pomegranate juice for that tart flavor and reddish-pink hue. 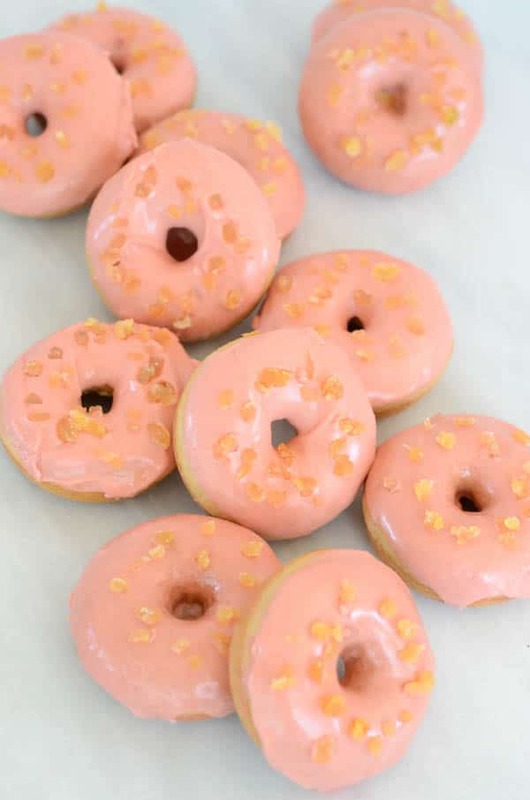 These doughnuts are tasty AND pretty! So, what do you think? 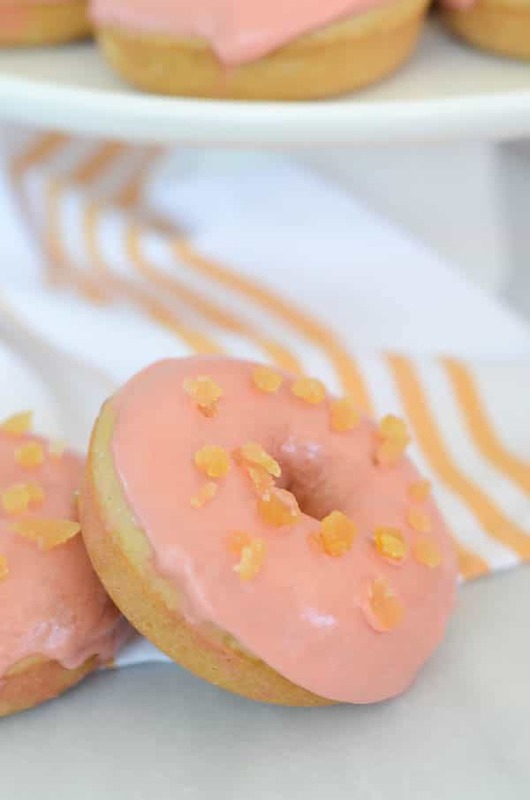 Do our Vanilla-Ginger Doughnuts with Pomegranate Glaze sound amazing or do they sound amazing? I can guarantee they’ll be healthier (and MUCH tastier) than your average doughnut shop find. And if you want to make them in advance, simply bake, freeze, and whip up the glaze a couple of hours (or one night) before you want to serve them. The glaze will be wet and sticky at first, but will harden up slightly the longer it sits. I don’t know about you, but I’m going to be clinging for life to this recipe as I power through these next few months. There’s nothing like a doughnut to get you through some crazy times. What sweets or comfort foods do you turn to when life is spinning so fast you can’t keep up? Please tell me I’m not alone by leaving a comment below! Belly-warming vanilla and ginger baked doughnuts with tangy, sweet pomegranate glaze. Preheat the oven to 350 degrees Fahrenheit. Spray your doughnut pan with non-stick cooking spray, set aside. To make the doughnuts, first combine all dry ingredients (both flours, baking powder, baking soda, ground ginger and salt) by whisking together in a medium mixing bowl. In a small saucepan over medium heat, melt the butter. Continue to cook over medium heat until butter becomes slightly golden. Add almond milk and ginger syrup, stirring to combine. Once mixture is warm and combined, remove from heat. In a large mixing bowl, combine both sugars, the eggs, and the yogurt. Stir in the warm butter/milk mixture. Once combined, add flour mixture. Beat (with a hand or stand mixer) until all ingredients are combined. Spoon doughnut batter into a piping bag (or resealable plastic bag with the tip cut off) and pipe into doughnut pan. If you only have a 6-doughnut pan, you’re going to have to bake in two batches. Place in 350 degree oven and bake for about 12 minutes, or until doughnuts look set. 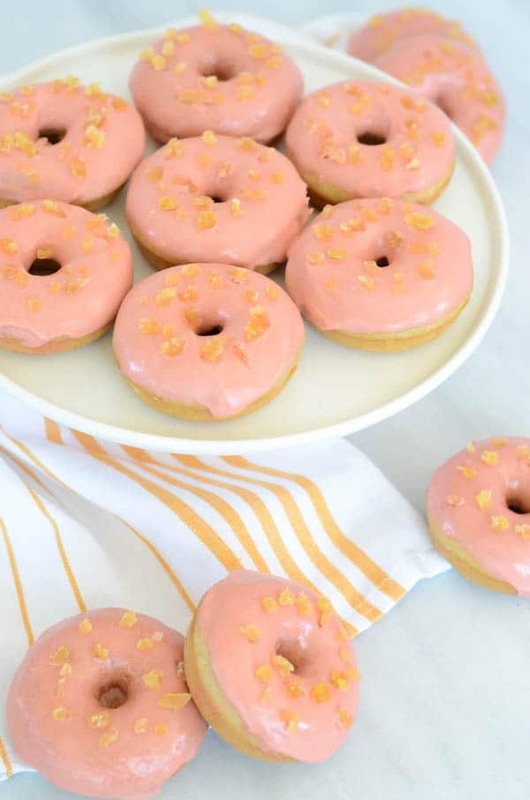 Remove from oven and let cool for 10 minutes, then take doughnuts out of pan and let finish cooling completely on a wire rack with a silpat or piece of parchment or wax paper underneath. Place second batch of doughnuts in oven, if needed. Next, make the frosting. Combine all frosting ingredients in the bowl of a stand mixer. Mix on medium speed until all ingedients are combined. 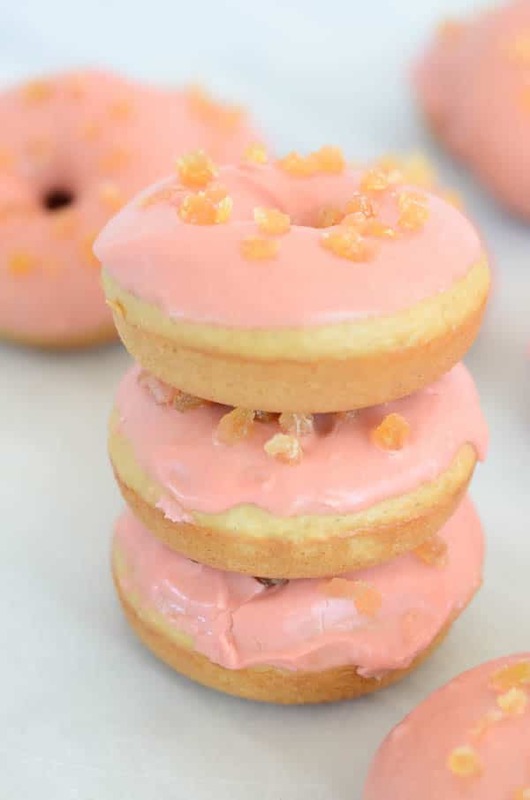 Once doughnuts are cool, dip the tops of each one in the frosting bowl to get the most even coat. Place back on wire rack after dipping to catch any drips (this is what the silpat/parchment/wax paper is for.) Immediately sprinkle on desired toppings, before glaze dries too much. Best if enjoyed immediately or within a day. This post was created in partnership with Sonoma Syrup Co. Although I did receive product in exchange for this post, all thoughts and opinions are my own. I truly LOVE Sonoma Syrup Co. products and their message and I am honored to work with such an amazing company! These delicious fritters are baked, not fried and studded with whiskey-soaked apples, all topped with a luscious maple whiskey glaze. Happy almost-Thanksgiving, friends! I can’t believe we’re just a few days away. Does anyone else feel like we spend so much time anticipating the holidays and then they are gone in a flash? I sure do so I’m trying to soak up every second I can…and eat every single one of these Whiskey Soaked Apple Fritters with Maple Whiskey Glaze in the process. I believe that life is a total balancing act. I don’t believe in diets or juice cleanses or excluding certain food groups from your diet completely (unless, of course, you have a diagnosed allergy or medical condition.) I believe that moderation in everything is key. 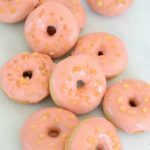 So, when I find myself craving a certain something that might not have the best nutritional value (ahem, apple fritters), I try to think of ways to indulge in my craving yet make it just a LITTLE bit healthier. Apple fritters have got to be one of my absolute favorite doughnut shop treats. 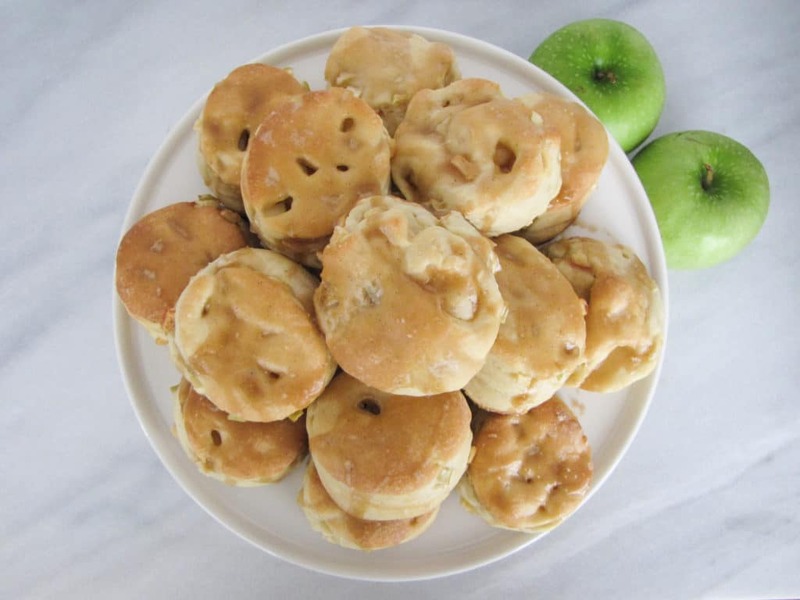 There’s something about the crisp outside with the sweet, moist cubes of apple inside that, to me, makes these treats far superior to any plain old cake doughnut. Plus, fruit is a HEALTH FOOD, right? See, always going the healthy route. I figured I’d have to add some other fun element as well, since the whole deep-fried goodness would be lost. I immediately started thinking about what I could do to the apples. Since I was already picking up some whiskey at the store for this, I decided sneaking some booze into this recipe would be just the thing. And it’s perfect for a slow weekend (or holiday!) morning in the fall, am I right? I wanted to do a yeast doughnut dough, because I wanted that heartiness and chewiness you get from the dough sitting and rising over a period of time (as opposed to a cake doughnut dough that is more crumbly and less chewy.) I found a good one on the Pioneer Woman blog and it turned out great on the first try (gotta love that since yeast doughs can be so finicky!) She ended up frying her doughnuts, but it worked just fine for my baked doughnuts as well. Regardless of whether you want to marinate the apples overnight or not, you have to make this dough the night before anyhow, so plan ahead. The prep time is really not that bad, it’s just the wait that’s excruciating! And before we get to the recipe, I MUST tell you about this maple-whiskey glaze. The sweetness of the maple with a little kick from the whiskey truly makes these treats. Because I was trying to be “healthier”, I was a little restrained in my glaze application. If you really want to just go all in, I highly recommend doubling the glaze recipe and full on dunking the fritters in it. You won’t be sorry. Here’s to slow holiday weekends with the changing leaves and a bit of chill in the air. 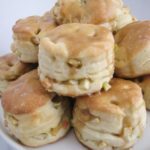 Brew up a pot of coffee, throw on some stretchy pants and settle in with a plate of these puppies. You won’t be able to stop at just one. Pinky promise. Place diced apples in a bowl. Add lemon juice and whiskey, stir to combine. Cover and place in refrigerator for at least 30 minutes, or overnight. Warm up cream in the microwave until it is “bathtub warm.” You want it to be warm enough to activate the yeast but not too hot to kill it. Add sugar to the cream and stir until dissolved. Pour yeast into a small bowl. Pour milk/sugar mixture over yeast, stir gently, then let sit for 10 minutes. Combine flour and salt in a bowl; set aside. Add beaten eggs to melted butter, stirring constantly to avoid the eggs being cooked. Add the egg/butter mixture to a stand mixer fitted with the dough hook. With the mixer on medium-low speed (about a level 3), pour in the yeast mixture. Allow the dough hook to stir this for a couple of minutes to make sure everything is thoroughly combined. With the mixer still going, add helpings of the flour mixture in ¼ to ½ cup increments until all of the flour is gone. You may need to stop the mixer as you go and scrape down the sides of the bowl with the spatula to make sure all of the flour gets incorporated. Once all of the flour is added, let the mixer go at the same speed for 5 more minutes. After five minutes, stop the mixer and scrape the bottom of the bowl. Turn on the mixer for 30 more seconds, then turn it off and let the dough sit in the bowl, undisturbed, for 10 minutes. After 10 minutes, transfer the dough to a bowl coated with shortening. Toss to coat. Cover with plastic wrap and refrigerate overnight, or at least 8 hours. 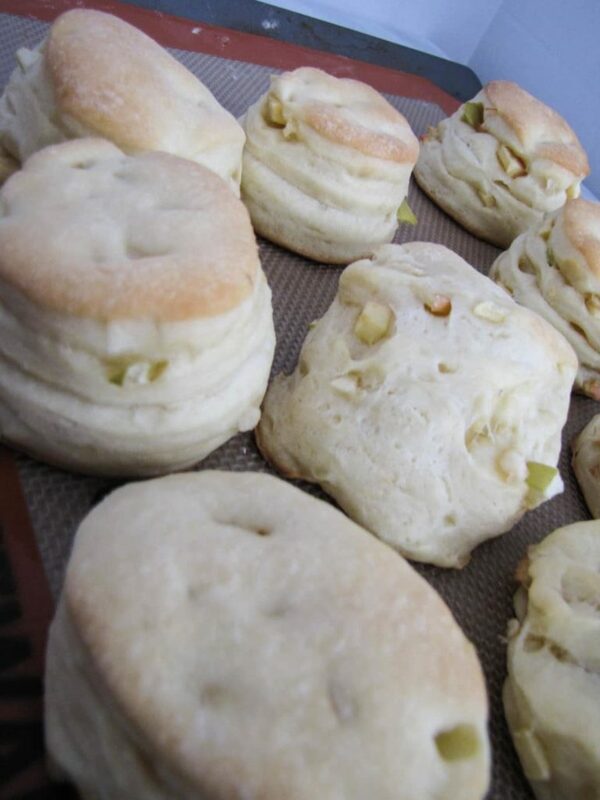 The next morning, remove the dough from the refrigerator and turn out onto a lightly floured surface. 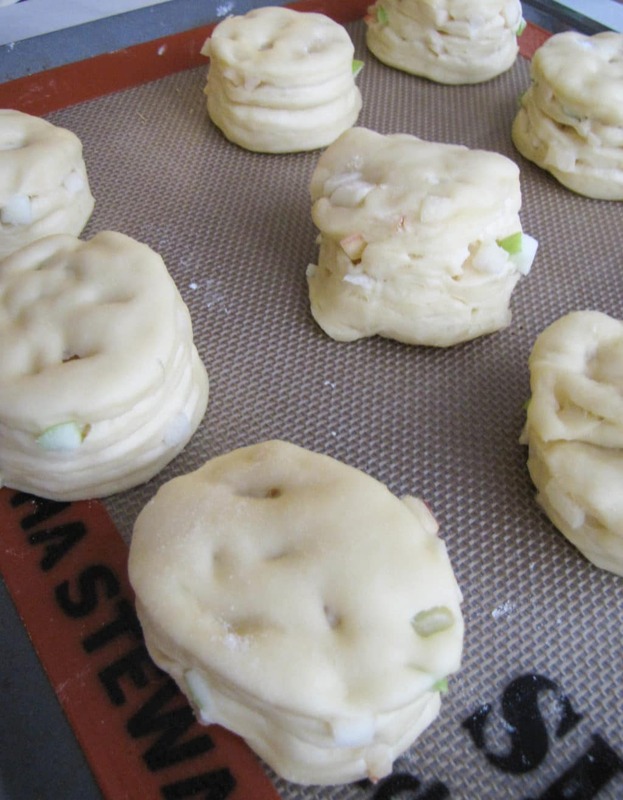 Roll the dough to a 1/2 –inch thickness. 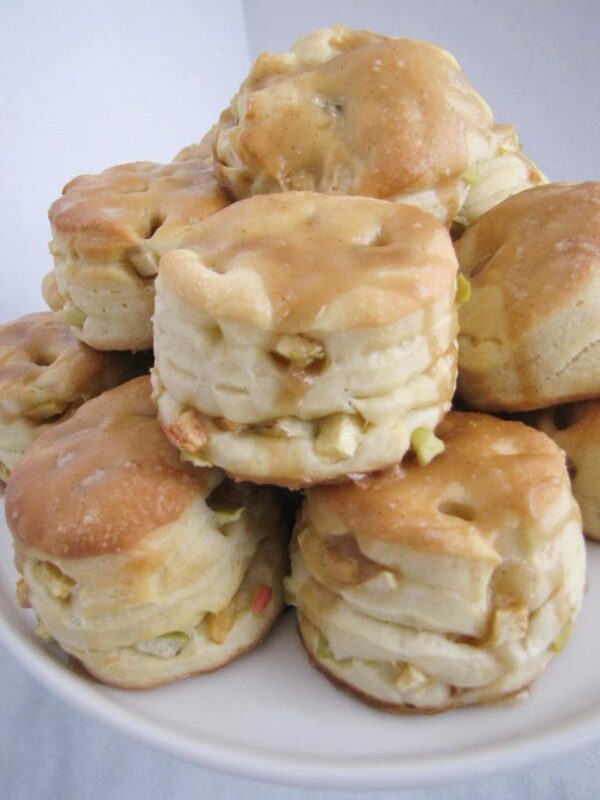 Sprinkle the whiskey-soaked apples on top and press them into the dough so they stick. 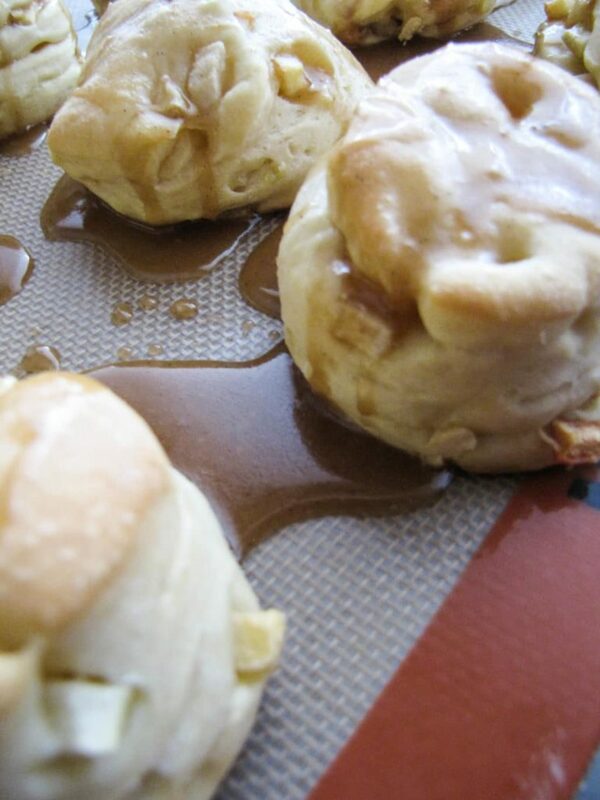 Fold dough in half (with apples inside) and then roll it out again. Right now we are basically incorporating the apples into the dough. Once the dough is thin enough, fold it over one more time (now into fourths) and roll out again to about a ½ - ¾ inch thickness. Fold up any loose edges so that we save as many apples as possible in the dough. Using a cookie cutter, biscuit cutter, or culinary ring, cut dough into desired serving sizes (I used a 2 ½ inch culinary ring to make circles.) Place on a cookie sheet line with a silpat or parchment paper. Cover cookie sheet(s) with a dish towel and let rise in a location in your kitchen that is free from drafts for at least one hour. You can always create your own rising location by placing the cookie sheets on your griddle on low heat for a couple of minutes before you place the fritters on them. 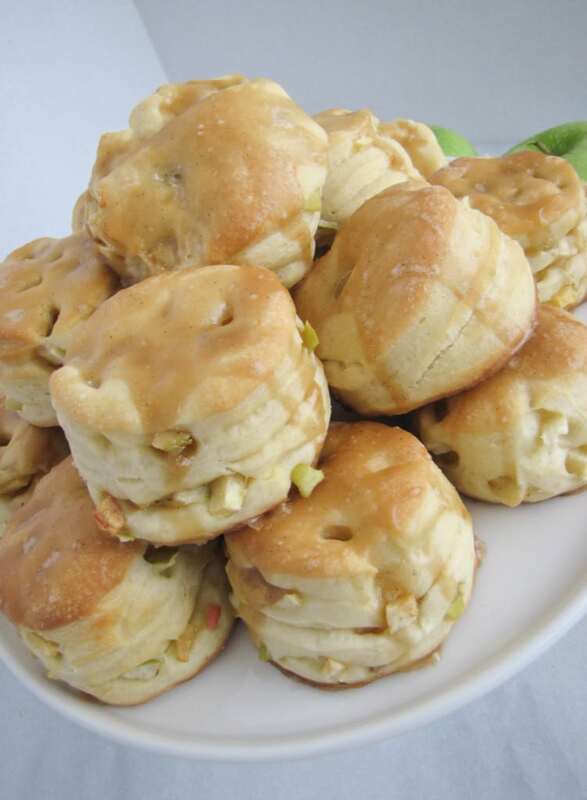 Once fritters have completed their second rise, preheat the oven to 350 degrees Fahrenheit. Once oven is preheated, add the fritters and cook for 15 minutes, or until they are a light golden brown. 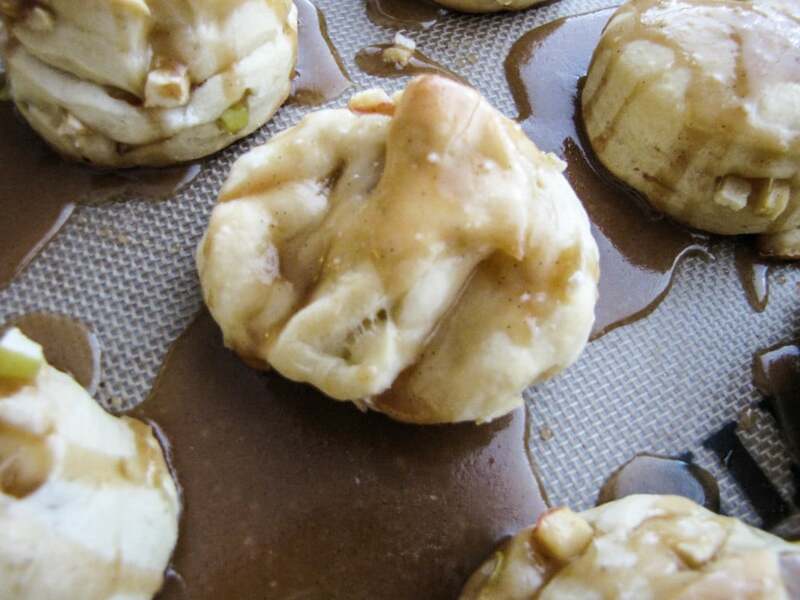 Remove from the oven and let cool on cookie sheets. Place a small saucepan on the stove over medium-high heat. Place the maple syrup, whiskey and butter in the saucepan and bring to a boil. Remove from heat and whisk in almond milk and vanilla extract, then powdered sugar. Let glaze sit for a few minutes and harden a bit before serving. Plate –> Mouth –> Done.